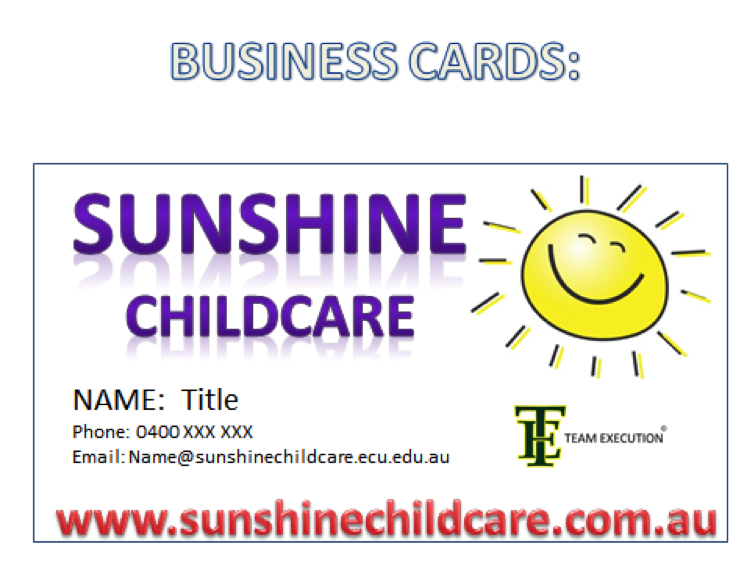 As per the following examples, the way in which we would attract parents to our day-care facility is through the use of bright and colourful flyers, posters and business cards located around the ECU Campus, the South West Institute of technology, nearby shopping centres and school to obtain enough children attending our day-care facility on Opening day. As per the critical evaluation we would have to do further investigations into if it would be financially viable to maintain opening hours during the holidays as we suspect the majority of our clients would be students. We are targeting University and TAFE students however we are also open to the general public and will promote to the general public. 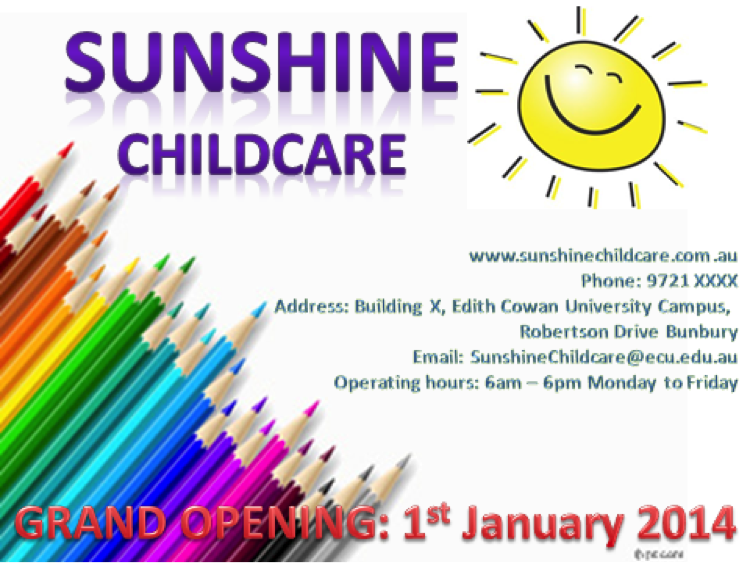 Our client base would also be largely made up of working mothers and we presume the majority of University students remain studying or work full-time during the holidays so would still require the day-care facility even during the holiday period. If not however this is something we would have to seriously consider and plan for financially and strategically. Ongoing promotions would include our radio advertisements, newspaper advertisements, Facebook, website and regular fundraising events at local fares, fates, markets, shopping centres. 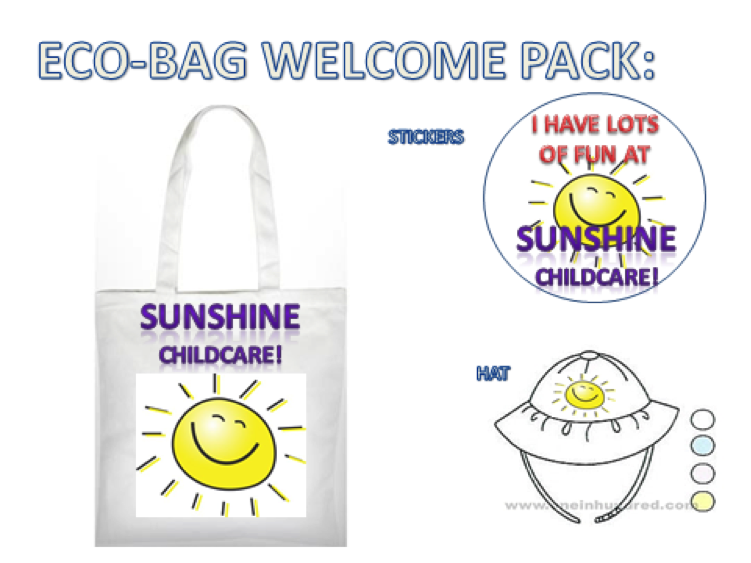 Fundraising events would include: Face painting, balloons sales, stalls, raffles, colouring competitions etc. We would ask for the parents volunteer as much as possible to help us out and feel like they are making a difference by being a part of our team and a contribution to our not-for-profit organisation.